With the plethora of successes that the comic book movie has seen over the last decade, it’s a little disheartening to see the Japanese equivalent fail to make much headway. There are just as many interesting and action-packed stories from manga and anime that deserve the treatment given to comic book movies. Instead, busts like Dragonball: Evolution (2009) and Ghost in the Shell (2017) have shown that live-action adaptations are challenging, especially when there’s already an animated counterpart. This was why I was excited to see Alita: Battle Angel (2019). While many manga/anime film adaptations fail to grasp the feel of the source material, Alita appeared to be a passion project for James Cameron. The fact that Robert Rodriguez directed this movie helped as well, considering how well he brought the graphic novel Sin City to the screen in 2005. Of course, he also directed Spy Kids (2001), which was colorful and full of fun action. In the end, I found Alita to be somewhat of a mix between the two. It had the brutality and violence from Sin City, mixed with the fun cyberpunk aesthetic and action from Spy Kids. The fact that it works at all is a testament to the creative team behind it. To sum up Alita: Battle Angel in one word, it’s “dense.” Almost every scene is paced at a quick clip and doesn’t spend too much time dwelling on any one topic. This allows it to cover a lot of ground that’s probably condensed down from a few volumes of the manga. It’s great that the story unravels so quickly, but some of the emotional beats aren’t prolonged enough for the audience to develop a connection. I did appreciate that it wrapped up most of its loose ends, but I hope it does well so we can see the clearly intended sequel. 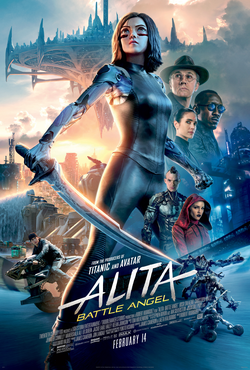 Probably one of the best anime live-action adaptations to date, I give Alita: Battle Angel 4.0 stars out of 5.